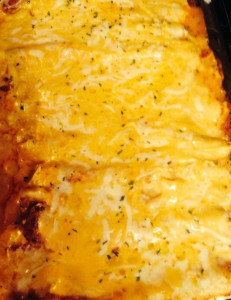 Are you intimidated by lasagna? You don’t have to be. It’s not as hard as it may seem. Fill a large pot with water. Set it to boil. In another pan, brown the sausage, onion and garlic together. When done, add the tomatoes, tomato sauce, tomato paste, salt, pepper, and Italian seasoning. Bring to a boil, then cover the pan and simmer while the noodles are cooking. When the noodles are barely soft (they can be firmer than you think), rinse them with cold water. Reserve 1/2 cup of mozzarella cheese. In a bowl, mix the ricotta cheese, the rest of the mozzarella cheese, egg, parsley, and a pinch of salt and pepper. The mixture will be thick. Spray a rectangular pan with nonstick spray. Line the bottom of the pan with noodles. Next, put a layer of sauce. Top with a layer of ricotta cheese mixture. Continue this process until ingredients are used. Top with reserved mozzarella cheese. Cover with aluminum foil, and bake for 45-60 minutes, until the sauce is bubbly. When you have a family, it can feel like you have to cart your entire house into the car for a trip to the local park. There are some things you can do without while others are vital for the family for short trips to the local park, long road trips or even car rides to Grandma’s house. While you should have travel toys and games for certain situations, you should have an entertainment system in the car for them too. For example, have a supply of movies or video games as well as devices for them to use on long car rides. When it comes to well-behaved children in a restaurant or wild maniacs who can’t sit still, it often comes down to the type of entertainment you bring for them. Have crayons, travel games or toys ready to be brought into the restaurant at a moment’s notice. The dollar store has plenty of items that can keep your child occupied. It can be quite expensive to visit a store or restaurant while on the road, so make sure to pack emergency snacks like nuts, dried fruits or drinks that can hold the child until you’ve made it to your destination. These items should be able to survive in the car for more than one day. There are times when there’s a huge mess that needs to be cleaned with more than the small cloths that might be in some of the other kits you’ve included. Have a large, absorbent towel or two in the car for large drying situations like kids who spill drinks on themselves after you’ve pulled away from the drive-through. This can be a purchased kit or one you build yourself. Bandages, cold compress, adhesive tape, scissors and gauze pads should be the basics that you include in the kit. You can add your own items if you find that the family needs them regularly like roller bandages for sprains or antiseptic wipes for scrapes. Bug spray is a great addition to the kit too. Extra sweaters, sandals, sneakers or pants can be an essential if a little one has an accident or tosses their shoes while you’re getting other children packed into the car. It can’t hurt to have items that can change with the weather too. It might be summer, but there are times when a hoodie is necessary. Blankets, fluffy pillows, stuffed animals or their favorite customized stuff can make nap-time less stressful when you’re on the road with your little ones. Don’t forget to grab their favorite sleep soother like a snuggly teddy bear or favorite blanket. For long car rides or quick trips with bored children, a plastic play surface for board games or coloring can keep them occupied as you drive. You can purchase one or build it yourself by purchasing a tray from the dollar store. Metal trays can work great if you want to add magnets to the back of some of their items. It lessens the problem with dropped pieces. You can also make the tray more appealing to your kids by adding some colorful custom stickers on it. Whether you have a little one who is prone to car sickness or an adult who doesn’t like plane rides, it’s good to have a sickness kit. It should have antibacterial hand sanitizer, latex gloves, vomit absorbers, scrapers and plastic bags for trash removal. The bag can include motion sickness pills as well as small hand towels for dampening. It’s not recommended that you leave water in your car that you plan on drinking, but you should have water for cleaning messes like sticky hands. Keep 3 or 4 bottles in the car for that purpose, and don’t forget to bring drinking water for the kids and yourself. You’ll have to decide what your essentials should be depending on your family’s needs and the places you plan on going together. These should be items you don’t leave home without packing into your car. Good luck, Mama. We hope your trip leaves you with fond memories for a lifetime.